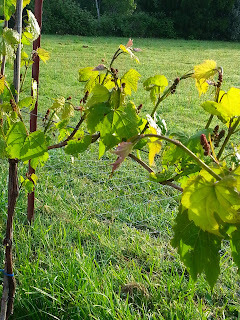 Our St. Croix is looking good, covered with pretty little red flower buds. I planted it just a couple of years ago. It has just taken off. I put them in a little strip between us and our neighbor, beside the barn. When the sun moves across the sky in the summer time, they get good long exposure all day long. We should be able to get our first crop off them this year. I'm anxious to see how the grapes and the wine from them comes out.